Rolls, roll sets and bags of the newest coin from the United States Mint America the Beautiful Quarters® Program launched today, April 9. 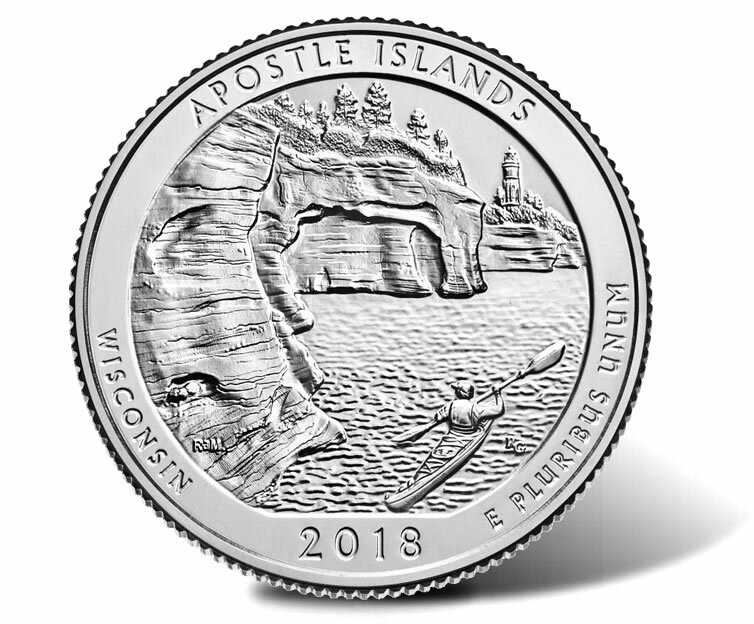 The second 2018-dated quarter from the series honors Apostle Islands National Lakeshore in Wisconsin. Products options range from a single 40-coin roll for $18.95 to three-roll sets for $46.95, with several choices in between. 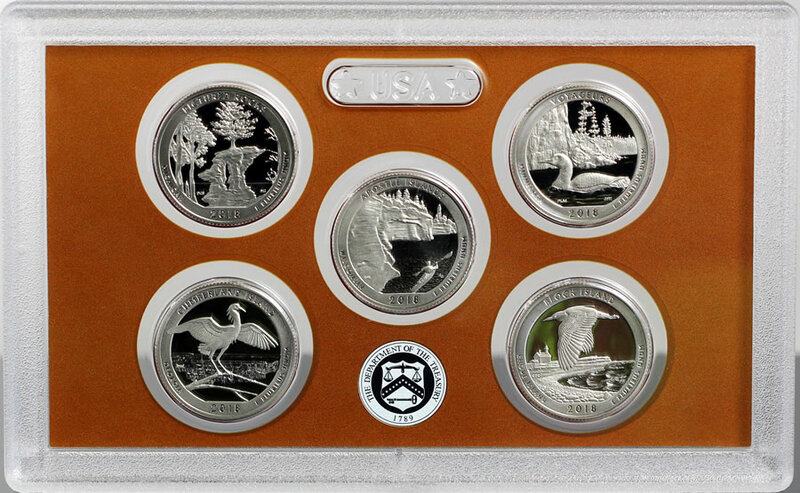 All include circulation quality Apostle Islands quarters depicting a design emblematic of the national lakeshore. The national site was established in 1970 and includes 21 islands and 12 miles of mainland by Lake Superior at the northern tip of Wisconsin. The lakeshore offers abundant recreational opportunities including hiking, sight-seeing, sailing and more. The U.S. Mint presented nine design candidates for the image found on the Apostle Islands quarter. From those nine that were reviewed, one offering a likeness of the sea caves at Devils Island was chosen. A lighthouse is found of in the distance. Wisconsin’s Apostle Islands National Lakeshore quarter depicts the sea caves at Devils Island with the lighthouse in the background and a kayaker paddling in the foreground. This quarter is the second of five for 2018. Richard Masters designed the reverse and Renata Gordon sculpted it. In the following U.S. Mint video, Gordon talks a little about her work on the quarter. Quarter dollars since 1932 have shown the same basic obverse (heads side) effigy of George Washington, and the Apostle Islands release is no exception. The likeness of the first U.S. President is the work of John Flanagan. Inscribed around the portrait are “UNITED STATES OF AMERICA,” “LIBERTY,” “IN GOD WE TRUST,” and “QUARTER DOLLAR.” Mintmarks found on the obverse indicate the coin’s production facility with ‘P’ for Philadelphia, ‘D’ for Denver, and ‘S’ for San Francisco. The specific quarters in these products have never actually been released in circulation. However, the Denver and Philadelphia facilities do strike them for general circulation. The San Francisco circulation quality quarters, however, are produced solely for numismatic purposes such as these rolls and bags. 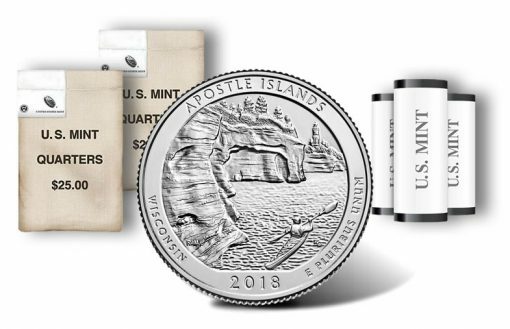 Apostle Island quarter rolls and bags are available directly from the U.S. Mint’s online store located here. They may also be ordered by calling the U.S. Mint at 1-800-USA-MINT (872-6468). An official release ceremony for the new quarter will be held by the national site on Wednesday, April 11 at 10 a.m. (CDT). The location of the event is Legendary Waters Resort, 37600 Onigamiing Drive, Red Cliff, WI 54814. Attendees will be offered the opportunity to exchange $10 cash for a roll of the new release. Also, a coin forum is scheduled for Tuesday, April 10, running from 6 to 7 p.m. at the Northern Great Lakes Visitor Center, 29270 County Hwy G, Ashland, WI 54806. The forum is an opportunity for the public to ask questions of Mint officials. Above is a CoinNews photo of the five 2018 America the Beautiful Quarters. These coins are special collector proof editions from the San Francisco Mint that launched in an annual set earlier this year. This series will include a total of fifty-six new quarters with one honoring a site from each state, the District of Columbia and the five U.S. territories. Along with the quarter dollars, the U.S. Mint also produces 5-ounce, .999 fine silver coins bearing the same designs as the quarters. This includes bullion versions which are sold through the Mint’s network of authorized purchasers and collector uncirculated versions that the U.S. Mint sells directly to the public. 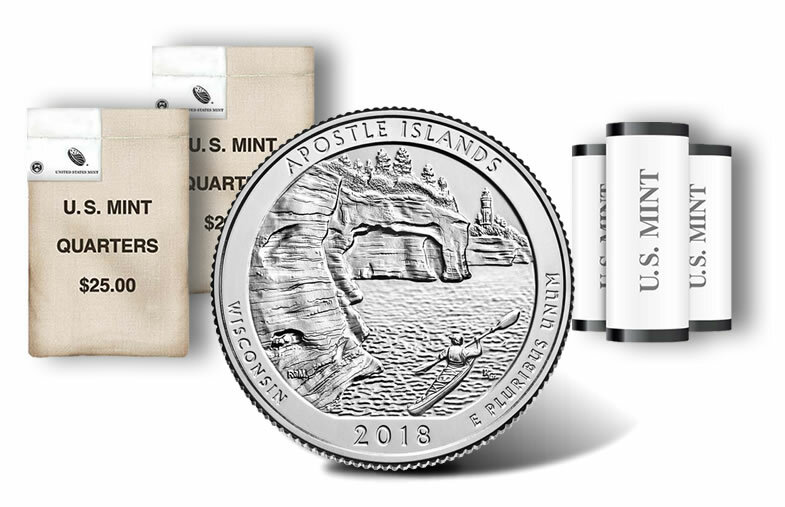 The 2018 Apostle Islands Five Ounce Silver Uncirculated Coin will be released later this week on Friday, April 13 for $154.95. Now that you mention it, Mouse, I guess this is why I never buy rolls and/or bags of new quarters from the Mint; the markup is patently absurd. Holy cow, Mouse, it looks to me like the good old downvote marathon has now evolved into a bonafide jackass jamboree! Copyright © 2007-2018 CoinNews Media Group LLC. No portion of this site may be reproduced or copied without written permission. P.O. Box 691701 San Antonio, TX 78269. Any use outside the given permissions constitutes copyright violation. All data and information provided on this site is for informational purposes only. CoinNews makes no representations as to accuracy, completeness, correctness, suitability, or validity of any information on this site and will not be liable for any errors, omissions, or delays in this information or any losses, injuries, or damages arising from its display or use. All information is provided on an as-is basis.